With so much information available, it is easy to get lost in a sea of customer data. In its quest to become a customer-obsessed organization, Mazda listened to 10,000 customers about their passions, feelings and interests to gain real human insights. Learn more about how Mazda is able to make better decisions and accelerate business performance by bridging the gap between human insights and first-party data. Just how expensive is that visceral connection these days? In a world of accelerated efficiency, OEM Tier One budgets will be scrutinized heavily. So, how in 2019 do OEMs make that amazing first impression that lasts throughout the (notoriously long) auto buying cycle? And how is TV’s role shifting in this process? What has worked BEST across Tier One efforts in the last 12-18 months? Are costs up or down, and how do things change if the economy gets bumpy? Parker will talk about creating this unique brand, which although electric, doesn’t consider Tesla a competitor. The company’s first models — the R1T pickup truck and an SUV called the R1S — are made to get dirty, to go to remote places. Case Study: Lexus Sales Jump After Partnership With "Black Panther"
Walton Isaacson spearheaded the partnership between Lexus and Marvel Studios and developed a marketing effort that included Lexus product integration in the “Black Panther” film, the creation of a graphic novel, a star-studded Comic Con launch event and a New York Fashion Week activation. The campaign helped LS sales increase 184% in February 2018 and 269% in March 2018 compared to 2017. After the Black Panther/Lexus spot ran, the LS 500 became the most searched vehicle on Kelly Blue Book, with a 2500% lift, along with a 1080% lift on Edmonds.com. Brand and celebrity partnerships have been the cornerstone of famous auto marketing campaigns for decades. How are these endorsements valued in 2019—especially in light of ubiquitous social media and a countless spectrum of influencers available to brands? How can you be sure an influencer partnership will amplify—rather than dilute—your brand’s affinity with their audience, and how are you measuring success? What's a road map to cost-effectiveness and long-term success? MediaPost’s Marketing Automotive Awards Luncheon will honor the brands and agencies whose marketing communications excelled in 2018. We'll begin with three interviews and then follow with trophy presentations to all of this year's winners. The link in the session headline jumps to the list of all winners. Alfa Romeo’s recent marketing efforts demonstrate that the company remains in love…with drivers in love with driving, and with big daring branding efforts. But as Bob Broderdorf explores with us, this legendary old world brand shows how to pull the levers of social media, digital video and innovative sponsorships to help a new generation fall in love with them. Discussion: Product Innovation + Consumer Education = Results? Consumers famously struggle to embrace in-car technology, so how do OEMs expect them to one-day embrace self-driving and assistance features? Introducing customers to new products can be a tricky proposition for OEMs, particularly in an era of rapid innovation. How do marketers broach the subject of introducing consumers to new, potentially amazing yet complicated products and features? What have OEMs learned educating consumers about newer product launches like subscription services? The AD Club and Verizon Media are joined by a panel of industry pros to talk about how they find and keep loyal drivers by delivering unique experiences through their marketing strategies. Faced with disruption as a result of the evolving ride share-economy, tech advancements in transportation, and consumers inundated by the IoT, manufacturers have a smaller window of opportunity to find these loyal drivers. To thrive in this changing environment, it’s more important than ever for brand leaders to leverage diverse data points to garner a better understanding of consumer life stages, the automotive path to purchase and the right environments for their messaging. With an estimated $16B in digital advertising spend slated for 2019, auto marketers are betting on innovative experiences to create meaningful, lasting connections. * (source: eMarketer 2018). Retrieve your wrist-band at the Cocktail Party sponsored by Legends. Located in Hell’s Kitchen, Manhattan, Jacob K. Javits Convention Center boasts a total area space of 1,800,000 square feet and has 840,000 square feet of total exhibit space. It is one of the busiest convention centers in the United States. 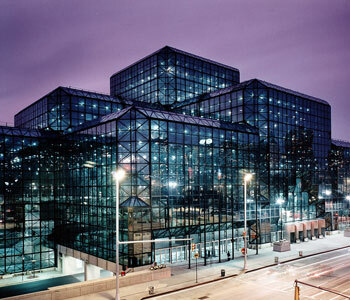 Javits Center hosts events such as the New York International Auto Show and New York Comic Con. In the city that never sleeps, the Javits Center is the nexus of American pop culture, where some of the most iconic brands have unveiled their latest ideas and creations. It's where deals are made, products are launched and heroes are born. The New York metropolitan area is serviced by three major airports: JFK International, Newark International and LaGuardia Airport. The Javits Center is served by the "7" subway extension with a stop right across the street from its main entrance. For complete transportation information including how to get to Manhattan by public transportation from all three airports, including the JFK AirTrain, log onto the NY/NJ Port Authority at: www.panynj.gov. Travel time by taxi from the airports to midtown Manhattan varies by airport. Travel time from LaGuardia to midtown can take anywhere from 25-40 minutes. JFK can take anywhere from 45 minutes to over an hour and Newark 40 to 60 minutes. JFK International Airport: To and from JFK and any location in Manhattan is a flat fare of $52 (tolls, surcharges of $0.50, $0.30 and tip are extra). To and from JFK and other locations will be charged as metered fares. Newark International Airport: The fare is metered and ranges from $50-$75 (tolls, $17.50 Newark surcharge and tip are extra). During weekday rush hours (6–9am and 4–7pm) and on weekends (Saturday–Sunday, 12pm–8pm), there is a $5 surcharge for travel to anywhere in New York State except Staten Island. LaGuardia Airport: The fare is metered and can be anywhere from $29-$37 (tolls, surcharges and tip are extra). While there is no parking garages at the Javits Center there are many parking garages throughout the Javits Center vicinity, see the parking section on "Get Here" page for locations and phone numbers of convenient parking near Javits center.